The Collier Friends of the Panhandle Trail starts a new season with a new look. The entire Collier portion has been resurfaced with crushed limestone; and the Walkers Mill parking lot has been black topped. We hope users will enjoy it! This work was possible from funds we received from users via donation envelopes in the mail boxes on the Trail, several grants and, of course, proceeds from multiple Rock the Quarry events. We now need to refill our coffers for new projects such as water lines then flush toilets. Please be generous!!! We welcome new members. We especially need one or two people to handle vendors for Rock the Quarry this year which will take place on Aug. 23 & 24, 2019. Come join us and share in the fun! The Collier Friends of the Panhandle Trail maintains the approximately 2.4 miles of the Panhandle Trail from Walkers Mill Entrance to Gregg Station. The Panhandle Trail is named after the Panhandle Division of the Pennsylvania Railroad, the abandoned rail line upon which it is built. The Panhandle Trail stretches for 29 miles from Walkers Mill in Collier Township, PA to Colliers, WV. 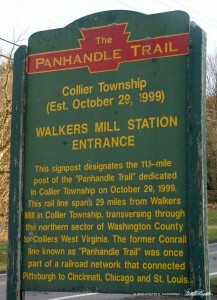 As of August 2008, the entire trail is complete from Collier Township, PA to Colliers WV. Collier Friends of the Panhandle Trail is powered by dedicated volunteers and always welcomes new board members to help in planning annual events and in keeping up with regular trail maintenance. Visit our Contact page for information about volunteering and joining the board, as well as open positions as officers on the board. This website pertains to the portion of the Panhandle Trail maintained by the Collier Friends of the Panhandle Trail. For portions of the Panhandle Trail located outside of Collier, click on the “Links” button above or search the Internet. And sign up for our BLOG to read the latest news and to AUTOMATICALLY receive notices about trail events. Jennifer, you are all more than welcome! I usually manage comments on the website and Facebook and didn’t see one, but we did have a slew of spam earlier this year that your message may have been caught up in. That would be next week, June 26? There is no fee to use any of the shelters, only if you want to reserve it to be sure it’s open to you when you arrive. I can’t see the need for that on Tuesday afternoons, even a group of 20. Bear in mind the trailhead parking often fills up so one of the other entrances, Sunnyside or Gregg Station, is often empty at the same time. There is a shelter with four picnic tables at each of the entrances. Have a great time! I will check, Cali. They are very hard on the limestone chip surface which needs to be repaired sometimes if the horse is only walking, but there is a grassy berm along much of the trail and people have ridden their horses alongside the trail. Where would you be entering the trail? Of 20 . Contact me at jevans@paconnectingcommunities.org we will be there this coming Tuesday . Does anyone know if horses are permitted on this trail at any point? Can we pave the ramp to the bridge at Sunnyside? very bad shape. at least put crushed limestone on it instead of asphalt rocks. it is an accident just waiting to happen. whats the liability on that? Can we at least pave the parking lots to the trails at the Walker’s Mill and Gregg Station trail heads? They are very hazardous to walk, bike and drive on, with chips flying all over, damaging vehicles. They are difficult to walk on or bike thru or push strollers in. Any discussions on extending the trail to Carnegie? How bout a crushed asphalt lane next to the crushed limestone?There is a ton of it in Oakdale that can be recycled and reused. There should be enough room for it where the grass is now. Who does the upkeep / maintenance on the trail? other than cutting grass, you’re slacking. There is a New bike rental place in Mc Donald,PA, right off the trail,(Big silver and black building) called Tandem Connection, They have bikes of all sizes to rent, buy, and repair. Has electric bikes also. Also has ice cream. Nice place and owner is friendly. They have a 2nd store on the Montour trail in Hendersonville / Cecil, (just down the road a bit) near Cemetary of the Alleghenies. I highly recommend this place as well as going on the Montour Trail to see the view from the Bridge just outside of McDonald. PJ, our organization only maintains the first four miles of the trail in Collier Township. Check this website for some of the information you are looking for: https://www.traillink.com/trail/panhandle-trail/ Have a great ride! Are hunters allowed on the trail from Walker to Oakdale? Sorry, Brad, you were caught up in the spam folder. You would find information on the Weirton website. We’ve discussed that here Steve. It’s not likely because of expense and upkeep. S Johnson, not that we know of, but wouldn’t it be a great idea? Anywhere to rent bikes along the trail??? Please pave the Collier section of the trail. Does anyone know who maintains the panhandle trail in the Weirton WV area? My employer is interested in donating man hours . Hi Matt, great comments ! I too bike the trail, on both the crushed limestone and paved sections, almost every day and average about 16-17 mph on my 25 mile ride. Regarding higher speed on the paved section: Not true! My Garmin GPS bike computer tracks my speed and I only travel about 1 mph faster on the asphalt. This is at roughly uniform power output. I should however point out that while riding on the limestone I intentionally find the hardest/smoothest lines, which keeps my pace up. Thanks! I’ll share it on our Facebook page too. Found a USB FLASHDRIVE on the Panhandle trail today (EASTER SUNDAY) text 412-818-0917 to identify and claim. Both Asphalt paving and crush limestone cost about 40k to 50k per mile and yet Asphalt paving last years longer . Some trails with good bases last 30 years with Asphalt. Surveys taken in have major majority of people prefer Asphalt for year around use. Also a larger percentage of public can utilize a paved trail. Wheel Chair, baby strollers, roller bladders…Also the asphalt paving is a small foot print (a mere 10 ft width) These trails are environmentally friendly. Since recent paving Burgettstown to McDonald the trails in the summer are loaded with neighbors out walking and fellowshipping with friends they have not seen in years Also trail use is up dramatically. Few want to go trudge through mud and dust same things happened in the 1800’s when we had mud streets. I would sure be open to some alternative surfaces crush rubber crumb in in asphalt mix or like Oregon did with hard rubber sidewalks. A solid surface is need for the future. Rode most of the Panhandle for the very first time today. Everyone going the other way waves or nods! This is the friendliest trail I have seen! Regarding gravel vs. asphalt, the eastern gravel segment was perfect and the asphalt was very nice. The western gravel was too soft, almost like sand. I bike also. Crushed limestone is very tough on the drive train, requiring frequent cleaning and lube. half of my daily ride is on limestone. Half on the paved section. That has cut my maintenance in half. I would like for the entire trail to be paved, to allow riding after the rain, but understand that runners prefer the limestone. I hated it at first thought they should’ve left a limestone path..Now I love it at 50 I roller blade it now and I just love it.When I ride my bike it stays clean my chain stays oiled. I frequently walk the Panhandle Trail. At the age of 75, I find that dirt trails are more body friendly than the harder surfaces. I have been cycling the trail almost as long as it has been built. The section of the trail out of Walkers Mill maintained by the Collier Friends has become the most utilized section of the trail. That is a good thing and for that reason it is best to remain a crushed limestone trail for many reasons including Nancy’s input regarding runner’s preferences. Also, the concentrated usage by diverse users such as dog walkers, children walkers and baby carriages and cyclists demand an environment of safety for all. Cyclist are enjoying the new paved section in Washington county because the tire resistance on asphalt allow for speed that could create safety issues on the Collier section. As for maintenance, asphalt trails are great in the early years but when the tree roots begin to grow under the asphalt, bumps can feel like crossing railroad tracks on a bike and require ongoing repairs with asphalt which is expensive getting equipment into rural sections and are often not repaired. The Collier crushed limestone section is in dire need for repair due to limestone wash outs at sections with inadequate design and lack of maintenance attention for almost 10 years. The Collier Friends of the Panhandle needs to address this maintenance issue in concert with the Collier Township this spring. As a distance runner, who uses the trail on an almost daily basis, I am opposed to paving the trail. I have many runner friends who run on the Panhandle Trail as well. The softer, limestone surface is welcome relief from pounding the pavement day after day. If we want to run on a paved surface, there are more than enough opportunities to do so. I was reading the “paved vs crushed limestone” comments. I prefer the trail being paved. After it rains, the paved portion is suitable for riding a bicycle. After it rains, crushed limestone is too mushy to drive a bicycle on. I noticed the trail is paved with asphalt when crossing into Washington County from Allegheny County. Matthew, each community manages their own section of the trail. We only manage the section of the trail that is in Collier Township. This grant money does not pertain to our section of the trail. We have looked into the possibility for our section of the trail as the subject comes up now and then. The costs of installing and long-term costs of maintaining a paved surface vs. fine limestone chip is more than most communities can afford without grant money. The limestone chip is far more environmentally friendly, and most users in our community who have given an opinion prefer it. This petition was submitted July 21 to Weirton Park Board. This Petition was signed by several residents surrounding trail reads as follows: PUBLIC OPINION PETITION PANHANDLE TRAIL – We submit the high traffic use of the Panhandle Trail warrants paving for a solid long term solution. We further think the current plan to treat the trail with limestone, cinders or other loose substances is shortsighted and wasteful. The money granted Weirton for the trail should be spent wisely benefitting all- including elderly and handicap (a large percentage of our community). Pavement is a superior long term option that needs consideration. On our Maps page you’ll see a map of the entire trail. That’s the easiest way to place it and find directions. Where is the trail head located in Colliers WV? Greg, here’s a little more information from other board members. Are you familiar with the area around the trail, and Chartiers Creek? If not, just ask. “There is some native trout/previously stocked trout further downstream closer to BFI that have migrated up from Chartiers Creek within the past couple of years. Not sure if they made it up to the trail potion of the Creek. Maybe some carp as well. Visitors do fish in Robinson Run, which you’ll see all along the trail, criss-crossing from side to side. There aren’t any designated fishing areas because the creek is pretty shallow, but you can walk along the stream on the trail or through the woods and look it over for good spots. does anyone know of the fishing along the trail? Lynne, I’m so sorry we missed your question back in September. I hope you came to investigate, but if you didn’t get a chance this past year maybe next year. We do have shelters with picnic tables situated near every entrance to the trail. Because the trailhead at Walker’s Mill is pretty parked up early and someone with a walker may have to cross Walker’s Mill Road, the Sunnyside entrance in Rennerdale might be better. Parking is much closer to the shelter, and access for bikers and hikers is up and down the trail and then also across a footbridge and up into the woods in one direction and pretty level off toward Fossils Cliff in the other. There is a map page on this site so you can see where the entrances are. I love that the trail is NOT paved. Most hybrid bikes and any mountain bike can handle the gravel. As a runner, I prefer softer landing and seek the trail for its beauty and the cushion on my joints. Please keep it the way it is! Plenty of flowers, butterflies, grasshoppers and other wildlife every day. Gravel that washes out and us I’ll maintained is not a pleasant thing for bikers or walkers. Yup, its a bike trail now, not a nature and wildflower and hiking trail anymore! They’ve mowed all the wildflowers along the trail that brought the butterflies and birds and you bikers may not like the gravel, but it IS stormwater friendly. It is paved for about a half mile west of Burgettstown. paved into Burgettstown -also a petition to asphalt pave Weirton,WV to Pa state line has been circulated and soon to be submitted. Hi Dave, I just found out about the paved trail today. It is paved from McDonald to Burgettstown. I have not heard anything about it going any futher but then I didn’t hear about this being paved either. Yesterday I noticed that part of the Panhandle trail is now paved, starting about 6.5 miles west of the Carnegie trailhead and going westward. Don’t know how far they paved, as I turned around at the Montour trail spur. Are there plans to pave all the way up to the Carnegie trailhead ? How far does the paving go currently? Are the kids supposed to wear their costumes. Sure, it’s Saturday, October 24… starts at 7:00 pm. We’ll have a post up and notice on the Facebook page at the beginning of October. Thanks for asking, maybe we’ll post it sooner! Will you please tell me the date of the Halloween night activities on Panhandle Trail? I want to schedule a family get-together to coincide with that night. Thank you.